in a medium bowl, toss shrimp/chicken, sprinkles of salt and pepper, and chili pepper/creole seasoning. set aside. in a large saucepan, brown the cut sausage with olive oil, then add the onion, green peppers, and tomatoes. add the shrimp last. cook for a couple minutes and then slowly add in the cooked rice. if it looks too dry, add some water. then season with salt and pepper. next, add the worcestershire sauce and parsley. partially cover and continue cooking for about 15 minutes to allow flavors to combine. place broth and 1 c water in a large pot and bring to a boil. add tortellini, broccoli, and tomatoes; simmer 7 to 9 minutes or until tortellini are tender. stir in peas and corn. add spinach gradually. sprinkle basil and parmesan over top if desired. serve immediately. broth: in a large pot, combine chicken, onions, carrots, celery, garlic, bay leaves, salt, pepper, thyme and 10 cups of water. bring to a boil; reduce heat and simmer, covered, 20 minutes. remove chicken thighs to a cutting board and shred meat from bones. reserve meat and add bones back to pot. continue to simmer, covered, 45 minutes. strain broth into a second large pot. discard bones and other solids. remove the bones from the pot after the 45 minutes. soup: bring to a boil. add bouillon cubes and salt. stir in noodles and cook about 7 minutes or until noodles are tender. 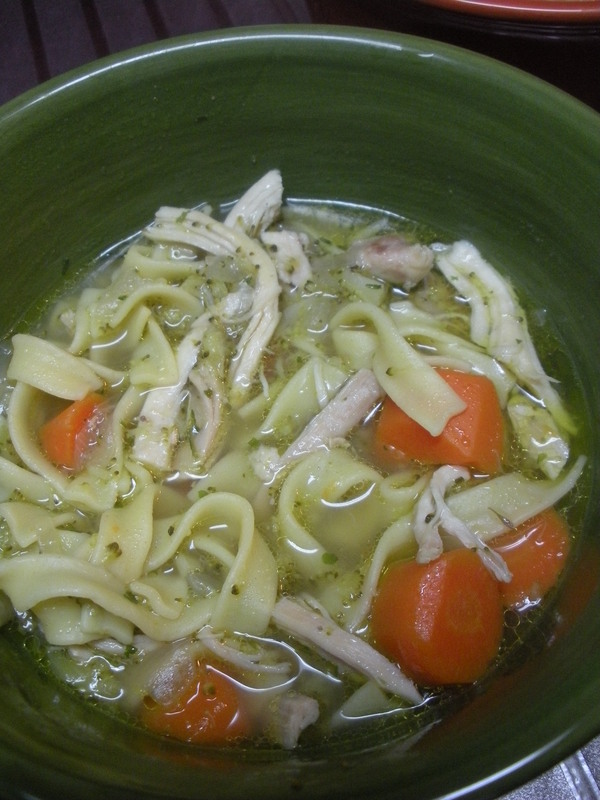 stir in parsley and reserved chicken. cook 1 minute to heat chicken.